To ensure that your weighing scales or balances are weighing correctly we recommend that they are checked with calibrated weights on a daily, weekly or monthly basis depending on how important the measurement is to your product or process and what the implications would be if the weighing equipment was out of tolerance. You will probably have a weighing company calibrating and certifying your weighing equipment six monthly or annually but this only ensures that the scales are correct at the time of certification and if the weighing results are important to you then we recommend additional checks to ensure that any damage or a fault has not caused a calibration error. Even a poorly fitting protective cover can cause significant weighing errors that are not obvious without checking with calibrated weights. Technically a calibration weight or test Weight is a Mass rather than a Weight. Weight is the force applied by a Mass when gravity is acting upon it and this is the force measured by a weighing scale or balance but Weight is the commonly used term, so we use it throughout this guide. A nice way to think about Mass and Weight is; the Mass of an object will not change even if it is on the moon but the force applied by the Mass as measured by a weighing scale and known as Weight will change because there is less gravity acting upon it. On the moon a 1000g Mass will have a Weight of about 166g and a person weighing 80 kg will only weigh 13.3 kg. 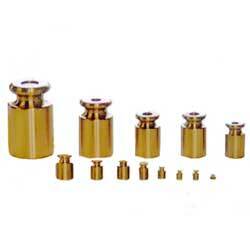 Good quality calibration weights should be made of a stable material with very low magnetism. They come in many different shapes, sizes, materials and accuracies and below we have given some information to help you choose the most suitable test weight or calibration weight for your application. 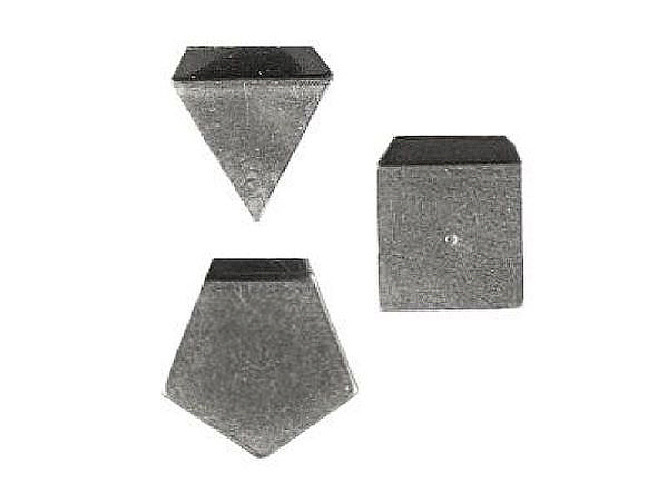 These weights are the most common type of test weight used for testing industrial scales, commercial scales and retail scales. The weights are usually adjusted to the M1 tolerance or class which equates to an accuracy of 1:20,000 or 0.005% , for example a 20 kg (20,000g) calibration weight with an M1 accuracy will have a maximum error, when supplied, of +/-1g, see the Weight Classes below for further details. These weights are designed to be lifted by one person but please bear in mind that the larger weights can be difficult for some people to carry. The 5 kg, 10 kg, 20 kg and 25 kg are called bar weights because of the bar used as a handle and the weights from 100g to 2 kg are hexagonal. We recommend our M1 cast iron calibration weights for checking and calibrating all scales with a resolution (readability) of 1g or more. They have the advantages of being stable when used and kept in a dry environment, they also cost less than the other options. If you need weight for a wet environment we recommend brass or stainless steel weights because the iron weights will rust if they get wet and will soon go out of tolerance. Brass is a softer material than cast iron so these weights are less resistant to wear than the iron calibration weights but they are more resistant to water because they do not rust so they make a good choice for testing weighing scales in food factories and other environments where the weights can come into contact with water. If your budget can stretch a little more, you may wish to consider stainless steel weights as they are even more resistant to water and other contaminants and they are also more resistant to wear. 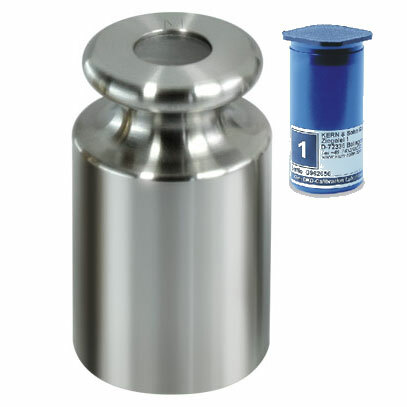 Stainless steel cylindrical weights are an excellent choice for calibration weights if your budget allows. 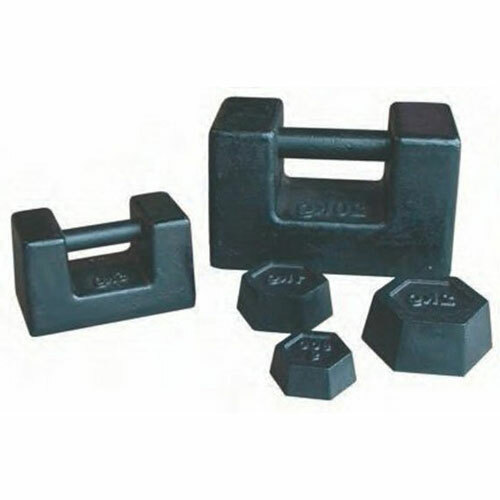 The only disadvantage over the other weights is that the larger weights are more difficult to carry than the iron bar weights but on the plus side they are resistant to wear and the most resistant to water and other contaminants; they are often the most stable and best test weight that is available. Stainless steel M1 class calibration weights are ideal for testing scales and portable balances in all environments, they are more stable than both iron and brass weights and if used carefully and kept in a case or box will remain within the M1 tolerance for many years. Stainless steel F2 class calibration weights are ideal for testing portable and precision balances, they have a smoother finish and are more accurate than the M1 class stainless weights. They need to be handled with care and kept in a case or box so that they remain within the F2 tolerance. Stainless steel F1 class calibration weights are ideal for testing and calibrating precision balances, they have a very smooth finish and are more accurate than the F2 class stainless weights. They need to be handled with care using special gloves and must be kept in a case or box so that they remain within the F1 tolerance. 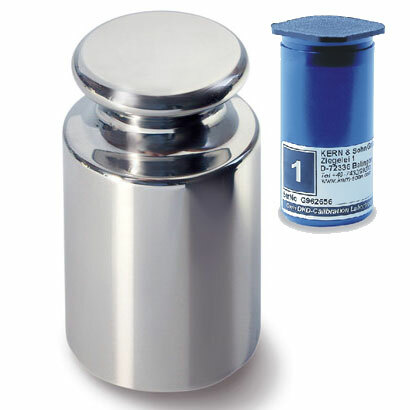 Stainless steel E2 class calibration weights are ideal for testing and calibrating analytical balances, they have a highly polished surface finish and are the most accurate weights that we sell. E2 weights need to be handled with care using special gloves or tweezers and must be kept in lined case or box in a non-condensing clean environment to ensure that they remain within the E2 tolerance. All weights below 1g are called Milligram Weights. These weights are made of Nickel sheet and come in various shapes so you can identify the denomination (size of the weight). The weights have a little lip on them to allow you to pick them up with tweezers, handling these with bare skin can put these weights out of tolerance very quickly. 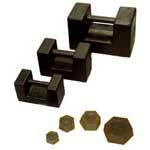 These weights are used to test force gauges, crane scales or other suspended weighing scales. The hanger is a weight in itself and will hold a number of slotted weights depending on its usable shaft lengths. The slotted weights are discs with slots in them and are designed to sit on the hanger. 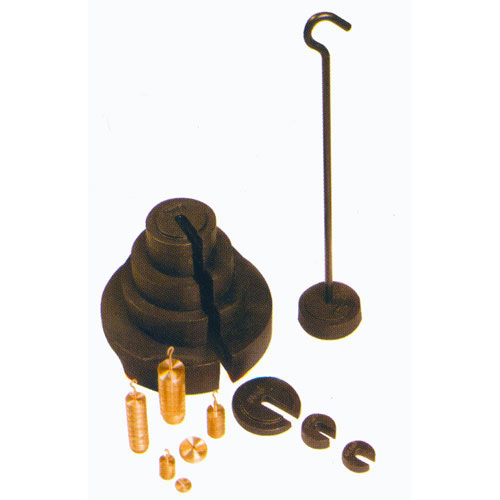 Weights are made of iron or brass; brass is used for smaller weights and hangers for testing up to up to around 1000g and have a 4.5mm rod and slots to suit. The M1 Iron slotted hanger weights are the most common hanger weights we sell and are suitable for testing and calibration in the 500g up to 200 kg range, they have hangers with a 12mm rod and slotted weights to suit. 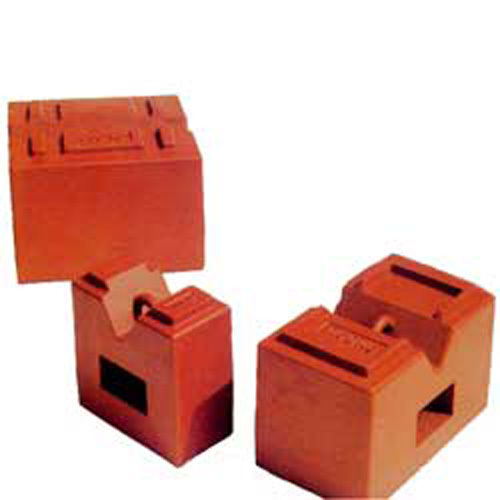 Cast Iron Block Weights weights are used for testing high capacity weighing scales or weighbridges and can also be used for proof load testing applications. The weights come in two different designs; one design as per the picture includes a fork guide and a loop in the top so they can be lifted by a fork lift truck or a hoist/crane, and the other design can be moved with pallet truck scales or a crane/hoist. The second design can also be used with a fork lift truck but because the first design uses a closed fork guide this is the one we recommend for fork lift trucks because it is a safer load. This is the part most people struggle with and it can be a little confusing. The class is like a rating of the tolerance. The tolerance is the prescribed limit of error - so how far out from the prescribed weight it is allowed to be. 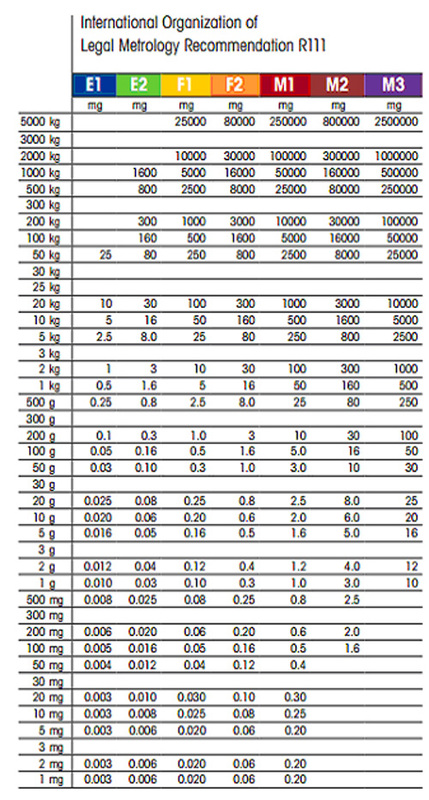 This chart shows the tolerances of each class of weight e.g a 20g M1 weight will have a maximum error when supplied of +/- 2.5mg. There are no definitive rules on which class of weights should to be used for testing weighing equipment but we hope you find the following guidelines useful. 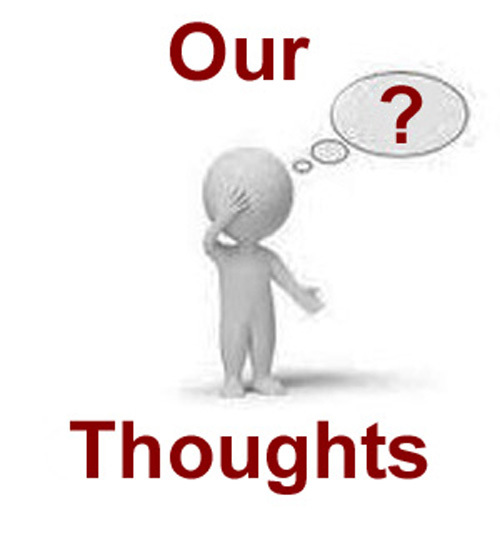 * The weight should be more accurate than the scale or balance that you are checking unless your tolerances allow otherwise. 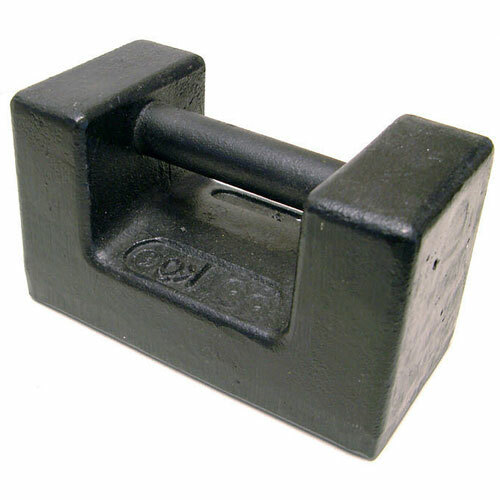 * M3 cast iron weights would normally be used for testing low accuracy scales. * M1 brass - Prices and uses are similar to the stainless, but stainless steel is a more stable weight. Trade Stamped Weights are not in the above tolerance classes. These weights have been approved by Trading Standards for buying or selling by weight, and have a little crown stamped into the bottom. They are calibrated to be a little over the nominal weight to ensure that when used with mechanical balances used when buying or selling by weight the customer receives at least the correct weight. This is the most basic and lowest cost certificate that we offer and is issued by our service centre staff under procedures controlled by our BSI audited ISO9001 quality management system using comparator weights traceable to National Standards . One certificate will cover all weights of the same tolerance, and will state that the weights are all within tolerance. This will satisfy many quality management requirements. This is as the Standard Traceable Calibration Certificate but additionally the weights are given identification numbers (these can be chosen by yourself or we can assign them). Each weight is then identified on the certificate with its exact reading, this will allow you to identify any calibration drift between calibrations and will satisfy all quality management requirements unless UKAS certification with uncertainty of measurement is required. This is only for Newton or Trade Stamped test weights. It is similar to our standard traceable certificate except the weights are sent off to Trading Standards to be certified. One certificate will cover all weights. UKAS stands for United Kingdom Accreditation Service and is the sole national accreditation body recognised by the British Government. This certificate is issued by Trading Standards and is a higher level of certification than the Standard Traceable Certificate. The calibration is performed under laboratory conditions and shows the uncertainty of measurement to be given with a 95% confidence level. One certificate is required per weight. DKD is the German Equivalent of UKAS. As one of our main weight suppliers is based in Germany, it is quicker and less expensive to have DKD certification rather than UKAS. DKD is recognised by UKAS as being equivalent so will still fulfil any requirements you have for this level of certification. This guide should give you enough information to steer you through the maze that is weights and certification but if you do require any further assistance please give us a call on 01842 751633 or send an email to quotations@blakeandboughton.co.uk as we are more than happy to help.